Here in this post, we are going to show you the back panel pictures of various leading inverter models available in the market. Almost all leading inverter models have the same kind of features, but they differ in outlook. 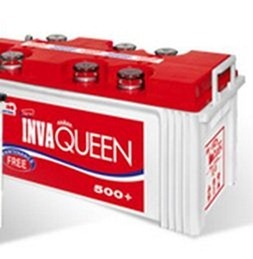 Some companies give different name for the same function in the inverter to differentiate their product from the crowd. So, don’t get confused, we will describe you about the sliding buttons and other functions you see in the back panel of the inverter. No worries! Back panel of Sukam Shiny Inverter, a pure sine wave model from Su Kam. In the above picture, there are two switches in between the power output socket and cooling fan. W-UPS means ‘wide UPS’ mode, which means the inverter operates in voltage range of 100 V to 300 Volt. In this wide UPS mode, the switch over time is little longer compared to ‘UPS’ mode. So, if you use desktop PC connected with Inverter in W-UPS Mode, your PC would restart during power cuts. It’s better to use UPS mode when connecting your desktop PC with your inverter for power backup. You won’t lose any unsaved data in your computer during power cut. This UPS mode ——W UPS mode is just similar to voltage selection button in Microtek Inverters. There are some advantages and disadvantages in using ‘UPS’ mode. If you plan to use Home UPS for your desktop computer, better you switch on UPS mode button, only when you use your desktop computer. Switch it back to W UPS mode, when you shut down your desktop PC. W-UPS mode (wide ups mode) or wide voltage mode (100 to 300v) is always safe and gives better battery life. If you don’t use any desktop PC with your inverter, always keep your inverter in W-UPS mode (100to300V) to get better battery backup during power cuts. Battery selection switch, which is called as charge current selection switch. LA means Lead acid battery or Normal Inverter battery. LA battery or Normal inverter battery – Most non-tubular inverter batteries comes under this category. LA mode in Sukam shiny gives only normal and safe charging current (upto 10 amp) to connected battery. This is just a safety measure to ensure long battery life. But during long and intermittent power shedding, we would recommend using the high charge mode (SMF/TUB) for Normal inverter batteries (non tubular). Slow or standard charging mode won’t quick charge your battery. It is safe to use batteries like ‘Exide inverter plus’ in high charge mode to handle and intermittent power shedding. Batteries older than 3 years are not capable of accepting the high charge current (up to 15 amp), there is a risk of battery failure. This is just a simple job to restore your inverter. Fuse in the back panel of the inverter may blow at times of high voltage or any other voltage fluctuations in the grid. NO need to call a technician to replace this fuse. Most inverters are provided with spare fuses. Check your inverter box for spare fuses. Some electricians will take the spare fuses provided with new inverters during installation and they don’t allow the consumer to replace it themselves. It is a not that much complicated job, you can try it yourself. Just open the fuse cap at the back panel of inverter (open it like opening a bottle cap), check whether the fuse is blown or intact. If you find faulty or blown fuse, replace it with new fuse provided with your inverter. Caution: Switch OFF the mains supply before working on your inverter. Replace the blown fuse with same amp rating, never try with lower or higher amp rating. Most users complain about the reboot problem when using home UPS with desktop computers. This is not a problem with inverter, you need to set the right mode in inverter before connecting desktop PC to your inverter. 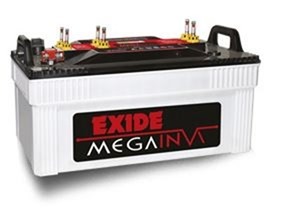 Exide inverter has three modes for charge current selection. Luminous Inverter backpanel is slightly different from others. No confusion, luminous has provided two fuses to facilitate the maintenance process. In Luminous, there is a cap on Charge current selection switch or battery selection switch. This is just a precaution to avoid making frequent changes in charge current selection. As we already said, using high charge current settings for old batteries is not recommended by most inverter manufacturers, so they put a cap on charge current selection switch. Don’t worry, you can make changes by removing the cap, it’s always safe to use high charge current for new batteries. 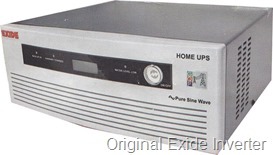 Regulated UPS mode is best for using desktop computers with inverter. No reboot problem! If you don’t use Desktop PC, then Use the default Unregulated UPS mode for better battery backup and performance.